Aspergillosis is an opportunistic fungal infection caused by a fungus named Aspergillus Fumigatus. As the organism is opportunistic, it causes disease mostly in immunocompromised patients such as those going through transplantation, chemotherapy or leukemia. In the majority of cases, aspergillosis occurs in people with an underlying illness such as tuberculosis or chronic obstructive pulmonary disease (COPD). It clinically manifests as aspergilloma or chronic pulmonary aspergillosis (CPA). It can also cause sinusitis, ear infection (otomycosis), eye infection (keratitis) or nail infection. It is proved that humans inhale about thousands of spores daily but do not develop the disease because of our competent immune system. Aspergillus grows on plants, soil, household dust and food items. 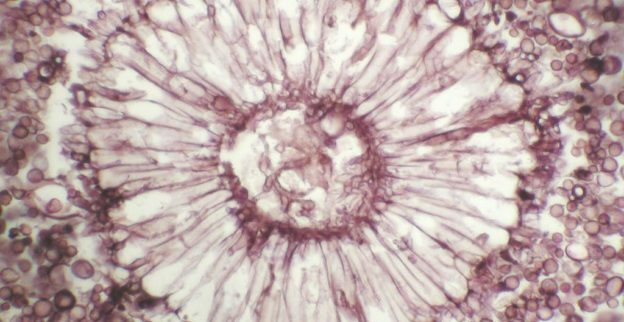 There are about 180 different species of the fungus of which only 40 can cause disease in humans according to the CDC. Aspergillus species especially grow on products having high sugar and salt content. These species are highly aerobic and grow where the oxygen concentration is high. They also grow on carbon-rich substrates such as monosaccharides and disaccharides. They grow on starch-rich food such as bread and potatoes. Some species also exhibit oligotrophy where they grow in environments without nutrition. The disease is not a reported infection in the United States, so it is difficult to determine the exact number of cases. Approximately, the disease likely affects 15 % of patients having cystic fibrosis and 2.5 % of those having asthma. Transmission occurs through inhalation of conidia in the air, showering in the contaminated water containing conidia or nosocomial (through hospital bedsheets and fabrics). Person–to–person transmission is rare. If the disease is invasive, it may cause coughing-up of blood, fever, chest pain and difficulty in breathing. It may also cause wheezing, fatigue and weight loss. Sometimes a fungus ball can be demonstrated by an X-ray. Fungus can also cause disseminated infection leading to end-organ failures, such as kidney and liver failure. This is caused by an allergic reaction to the fungus causing inflammation in the lungs. The symptoms are usually rusty or brown colored sputum, shortness of breath, and in rare cases, it may also cause fever. It may cause itching and fluid discharge which may stain a pillow overnight and cause pain. Due to debris accumulation in the external auditory meatus, it can cause a feeling of blockage of the ear. Itching and discharge are more marked than in bacterial ear infection. It may present with a red lining of the epidermis and the lining of the tympanic cavity. The fungus may also cause perforation. There may be a greenish or black fuzzy growth on the debris in the ear canal. Blockage of the ear canal may cause a mild conductive deafness. In diabetic patients, it may even erode the adjacent bones, like mastoid bone, and can even disseminate into the brain. It may cause congestion, runny or stuffy nose, decreased sense of smell and sometimes headache. Chest X-ray and CT: A fungus ball may be visible on a chest X-ray. A halo sign can be observed, which is a region of ground glass attenuation around a pulmonary nodule. A crescent sign may also be visible, which is a lung cavity filled with air and has a round radio-opaque mass. Microscopic: The fungus can be identified by silver stains like methenamine–silver stain. Aspergillus has septate hyphae which branch at acute angles of 45 degrees. The hyphae have dichotomous branching. For less severe and non-invasive forms, oral steroids for 7–8 months along with Itraconazole are given, because the latter increases the efficacy of steroids allowing less dose to be administered. For invasive bronchopulmonary aspergillosis, voriconazole and amphotericin B can be given. Sometimes, surgical debridement and removal of aspergillomas are recommended. For ear infections, drying and careful removal of the debris is done. Flucytosine (10 %), clotrimazole cream and econazole cream (1 %) are also suggested treatments for an ear infection. Posaconazole is used prophylactically in immunocompromised patients. Infection control and reduction of exposure and treatment of the infected person. Infection in animals: The fungus can cause infections in birds and ducks which are fatal. In dogs, it causes infection of the nasal passages.